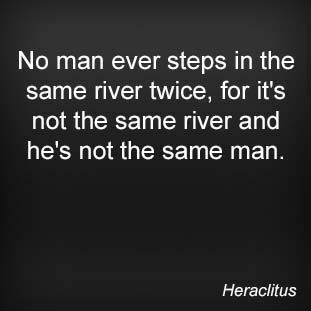 A wise man that Heraclitus! Every time we step into Twitter its not the same and we are not the same. We may not notice the subtleties, of change in temperature, change in composition, or the even the increase in fish from day to day and its only through looking back that we see what appear to be vast changes instead of an ever evolving thing. But perhaps we need to look forwards ? Heres where I come back to Parthas blog post and his thought that many people would like Twitter to be “a continued space of education and support.” I stand amongst those people and although this function still exists we also have the political (sometimes angst ridden) melting pot that sits alongside, which is by no means wrong … just different to what it used to be. I guess what I am saying is its up to us! The ecosystem of Twitter is as complex as human nature itself and the only thing we can be certain of is that it will continue to change. This is our space to shape and influence so lets ensure that it’s a balanced and productive space.